Cricket Australia CEO James Sutherland promised that the immediate cricket fates of Smith, Warner and Bancroft would be known within a day. 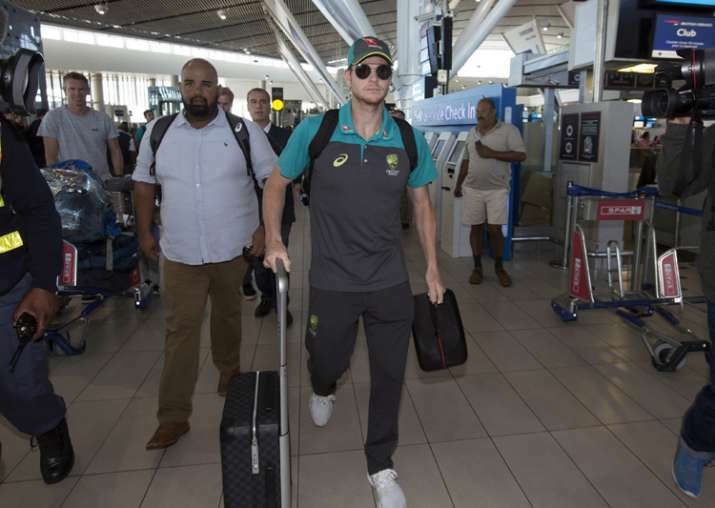 Steve Smith, vice-captain David Warner and batsman Cameron Bancroft were all to be sent home from the tour of South Africa for their roles in planning and carrying out a ball tampering scheme in the third test in Cape Town over the weekend. Angry and with his voice trembling at times, Australia's cricket chief has announced that team captain Steve Smith and two other players who plotted to cheat in a test in South Africa face "serious sanctions," which could end the international career of at least one of them. Smith, vice-captain David Warner and batsman Cameron Bancroft were all to be sent home from the tour of South Africa for their roles in planning and carrying out a ball tampering scheme in the third test in Cape Town over the weekend. They will face the outrage of their nation when they get home. "In regards to the three players on report, I want to stress that we are contemplating significant sanctions in each case," Sutherland told a news conference in Johannesburg. "These sanctions will reflect the gravity with which we view what has occurred and the damage it has done to the standing of Australian cricket." He stopped short of announcing any punishments for the three players, though, as an internal investigation into the cheating conspiracy that shocked a country of cricket fans is yet to be completed. Most of the players and backroom staff had been interviewed by Cricket Australia's integrity chief Iain Roy, Sutherland said. Roy still had to complete his report, but would do so with 24 hours. Sutherland insisted that initial findings showed Smith, Warner and Bancroft were the only members of the Australian team who had "prior knowledge" of the tampering plot. Coach Darren Lehmann, a target for scrutiny for the Australian media, played no role in the cheating, Sutherland said, and would continue as coach. Sutherland promised that the immediate cricket fates of Smith, Warner and Bancroft would be known within a day. "It's about the integrity and reputation of Australian cricket and Australian sport," Sutherland said. "Ultimately it's about whether Australians can feel proud of their sporting teams." The actions of Smith and Warner, the leaders of the team, and Bancroft, a relative newcomer, have also reverberated through the cricketing world. Critics have pounced on the apparent hypocrisy of an Australian team that often held itself up as the moral compass of the game. That underlined Sutherland's later comments that this Australia team's entire reputation has been tarnished. Warner, a pugnacious batsman who has a long lost list of disciplinary infractions in his career, was confirmed as being part of the plot for the first time officially. Australian news outlets reported Warner had become a more central figure in the investigation, had fallen out with teammates and could face a lengthy ban. Smith, the star of Australian cricket after leading the team to a 4-0 Ashes rout of England a few months ago, is expected to be fired as captain. All three face hefty bans considering the damage caused to reputation of Australian cricket and the humiliation. Smith and Bancroft confessed that, after a discussion during a break in play, they decided they would try to change the condition of the ball during the third test using a piece of yellow adhesive tape and some dirt collected from the side of the pitch. Bancroft was tasked to do the on-field tampering but botched it when he was caught by television cameras doing the tampering and then trying to hide the tape down the front of his trousers. The evidence from the TV cameras was overwhelming. Tim Paine will take over as captain of the team for the fourth test in South Africa starting on Friday, with Smith, Warner and Bancroft on a flight home Wednesday morning. Their places in the Australia squad will be taken by Matt Renshaw and Joe Burns, who helped their Queensland state clinch the domestic cricket title on Tuesday, and Glenn Maxwell. Australia trails 2-1 ahead of the final test in Johannesburg. Engulfed in a crisis, Australia faces losing a series in South Africa for the first time in nearly 50 years.